Outer Zone - Aviation News and Features from around the local area and beyond. 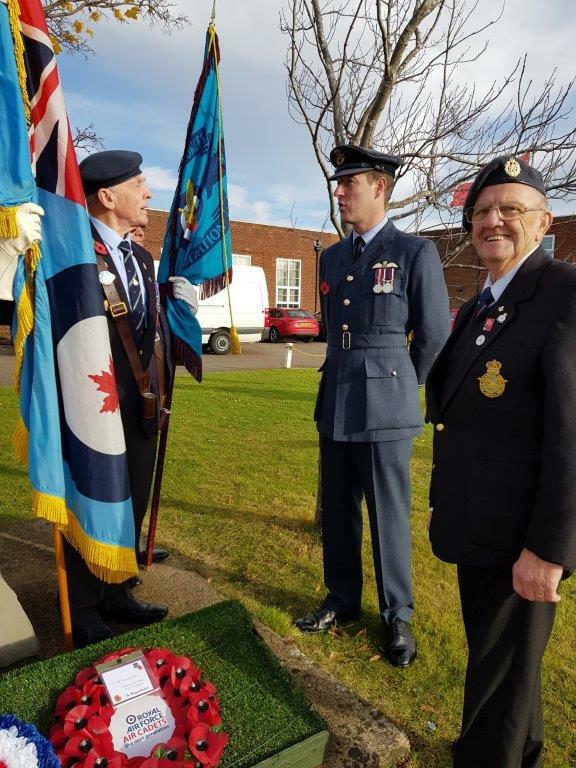 With the impending closure of the St George Hotel at Durham Tees Valley Airport the Middleton St George Memorial Association held what could be it's last Remembrance Service there on Saturday 10 November 2018 and there was an excellent turn out of both veteran's and serving RAF personnel . 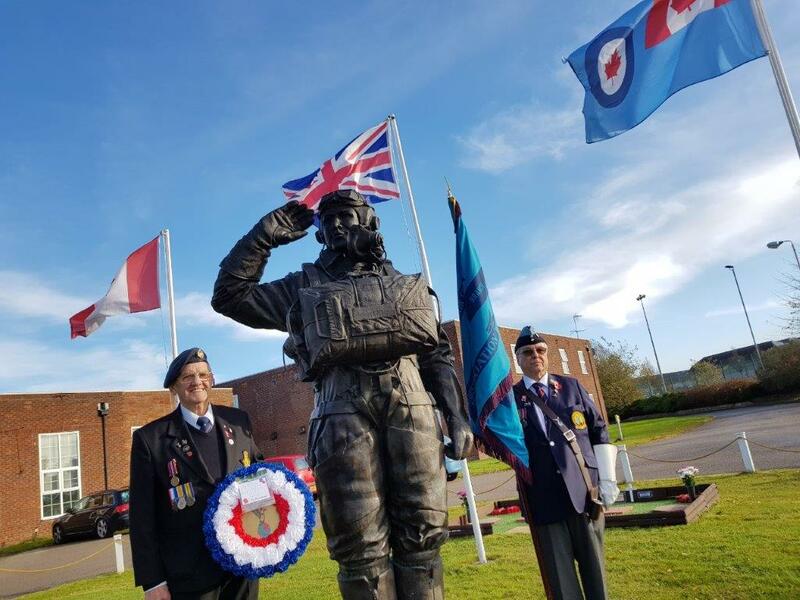 The Address was given by the Reverend Colin Lingard and wreaths were laid by representatives of the Air Cadets , the Royal Air Forces Association and Shaun Woods on behalf of Durham Tees Valley Airport. 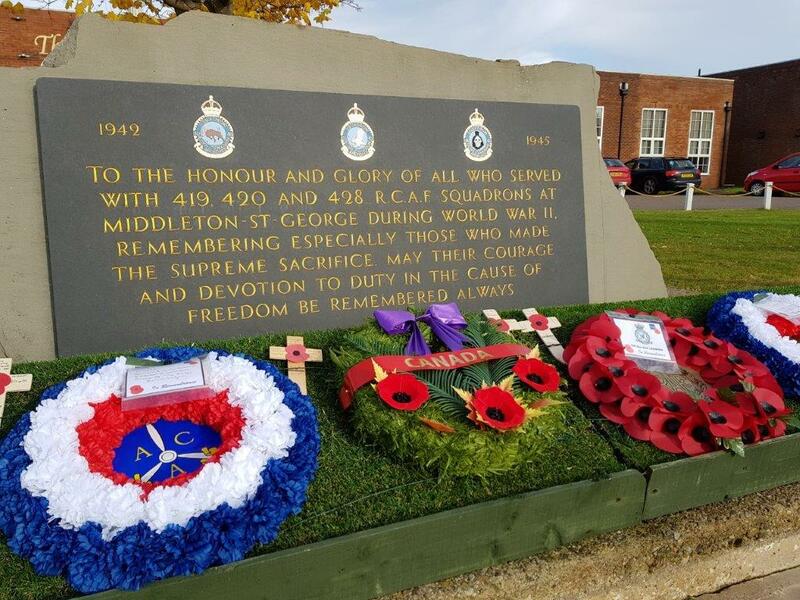 Wreaths were also laid by the Royal Canadian Air Force representative Captain Stuart MacWilliams, a CP-140 Aurora pilot currently on an exchange posting with 56 Squadron at RAF Waddington and Squadron Leader Phil Stewart of 100 Squadron at RAF Leeming . 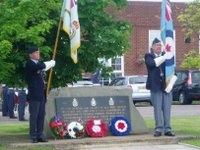 Personal tributes were made remembering those that had 'Failed To Return' . 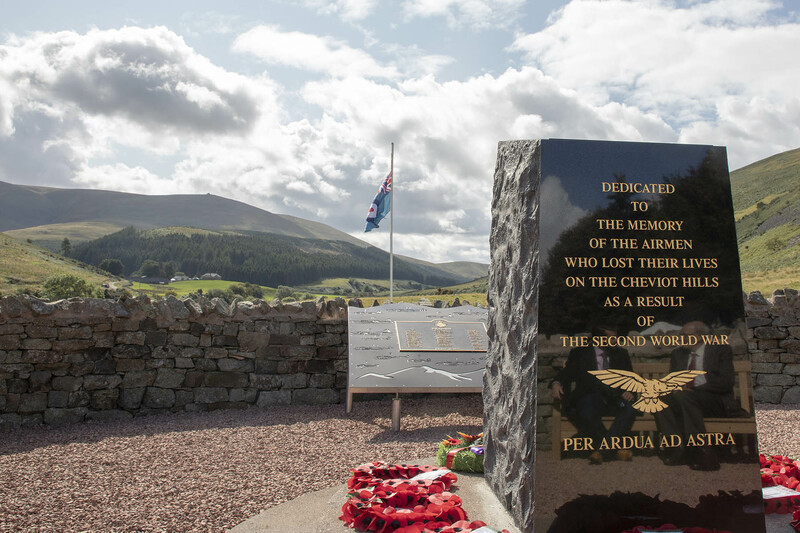 A new memorial to allied airmen who lost their lives in the Cheviot Hills of Northumberland in the Second World War, and the shepherds who tried desperately to save them, was unveiled by His Royal Highness, the Duke of Gloucester in one of the final events to mark 100 years of the Royal Air Force. 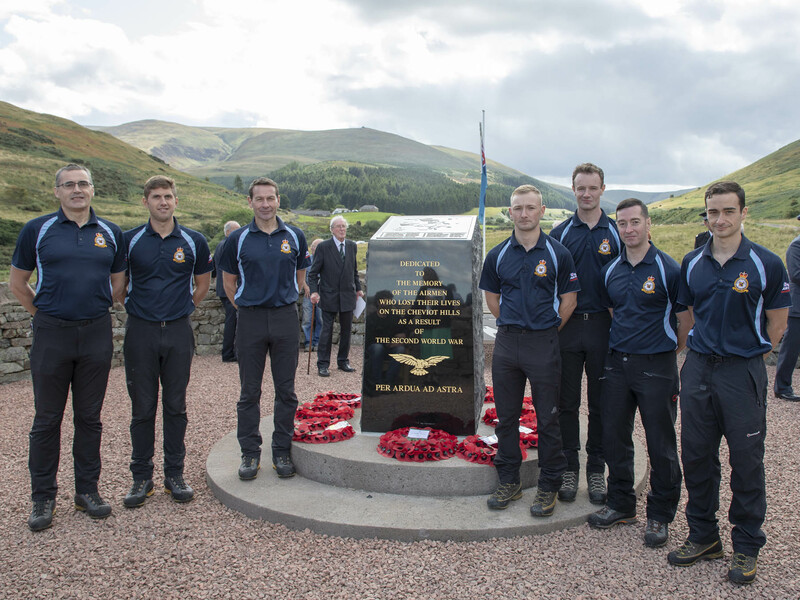 The memorial, set against the stunning backdrop of the Northumberland National Park, was overhauled as an RAF100 legacy project, with fundraising led by the Alnwick and Rothbury branches of the RAF Association. Originally unveiled in 1995, the polished granite and bronze memorial has been updated to recognise the courage of the shepherds who rescued and cared for some sixteen airmen who survived air crashes. A moving ceremony was attended by the Duchess of Northumberland, Civic Dignitaries, Senior Royal Air Force Officers, veterans, local farmers and shepherds. A guard of honour was provided by personnel from RAF Boulmer , whilst a Hawk jet from RAF Leeming’s 100 Sqn flew through College Valley for a poignant a low-level flypast. There were several stands for those attending to visit, including Royal Air Force Association and the Mountain Rescue Team based at RAF Leeming, members of which took part in the ten-mile Cheviot Bomber trail race raising funds for the memorial earlier this year. The present Durham Tees Valley Airport was previously RAF Middleton St George which operated as a bomber airfield during the Second World War. In June 1944, Lancaster KB726 of 419 (Moose) Sqn, RCAF, part of 6 Group Bomber Command, was taking part in an attack on the rail junction at Cambrai. It was fatally attacked by a Ju88 which left the aircraft burning and rear turret jammed, trapping the gunner, F/O George Brophy. Delaying his orders to abandon the aircraft, the mid upper gunner, P/O Andrew Mynarski attempted to free his fellow gunner, Brophy despite his own clothes being on fire. After unsuccessfully attempting to move the turret, Mynarski was told to jump by Brophy before it was too late. In a final gesture to his friend, Mynarski stood to attention and saluted the trapped George Brophy. By now his clothes and parachute were burning fiercely and sadly Andrew Mynarski died from his injuries shortly after being found by French civilians. All the Lancaster crew survived, including George Brophy, remaining in the rear turret which had stayed intact in the crash. On the crew’s return to England after the war they told of Mynarski’s amazing courage for which he was awarded the VC on 11th October 1946. 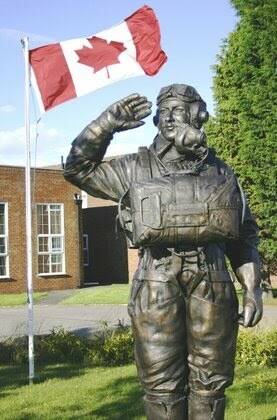 In recognition of his courage, a statue of Pilot Officer Andrew Mynarski was erected in the RCAF Memorial Garden at the St George Hotel following a successful campaign locally. The photographs were taken at the Rememberance Ceremony in June 2008, attended by veterans, local groups and officials, the Canadian and Royal Air Force, friends and members of the public. Following the ceremony and marchpast by veterans, a Hawk from our host 100 Squadron at Leeming, made a salute flypast in clear bright sunshine. FLAG members with CAS membership, visited the Scampton Heritage Centre and the BBMF Visitors Centre at Coningsby with CAS. 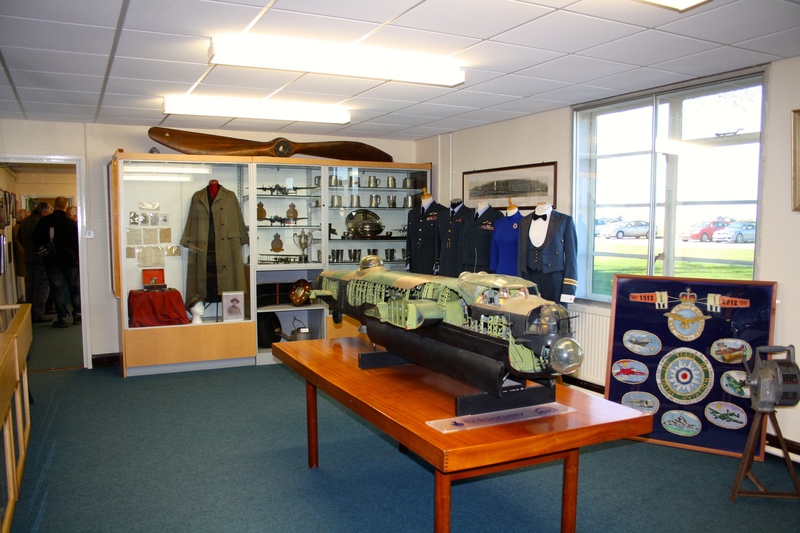 The Heritage Centre has moved from 1 Hangar into 2 Hangar which was the home to 617 Squadron at the time of the dams raid in May 1943.The added historical bonus is the opportunity to visit not only the grave of Guy Gibson’s pet labrador outside the hangar but also the office of the man himself on the first floor of the hangar annex. The Heritage centre moved into their new premises in February 2012 with the annex undergoing a complete refurbishment before being officially opened on 22 June 2012 by Wg Cdr Richard Turner, the very same date that Wg Cdr Gibson went to Buckingham Palace to be presented with his Victoria Cross. 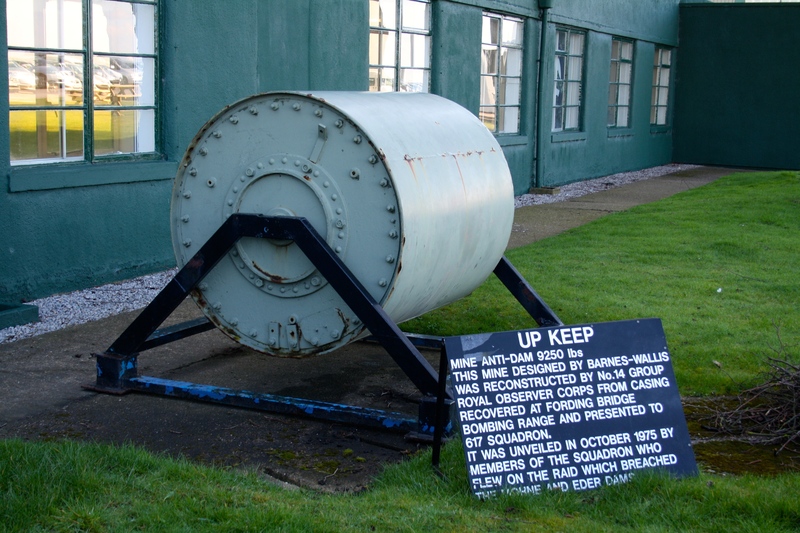 RAF Scampton and 617 Squadron as well as a Red Arrows museum; also displayed are examples of some of Barnes Wallis’s weapons designs and aircraft cockpit sections. 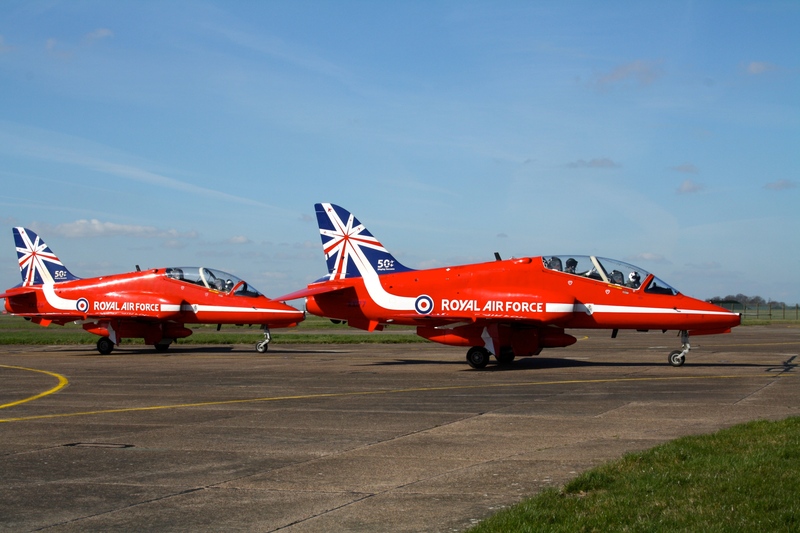 If you should be lucky enough, as we were, twice, the visit also offers the opportunity to see the Red Arrows aerobatic team conducting one of their practice flying display sessions or if not flying then perhaps on the ground and also a visit to their home of 4 Hangar to view their Hawk ‘gate guardian’. 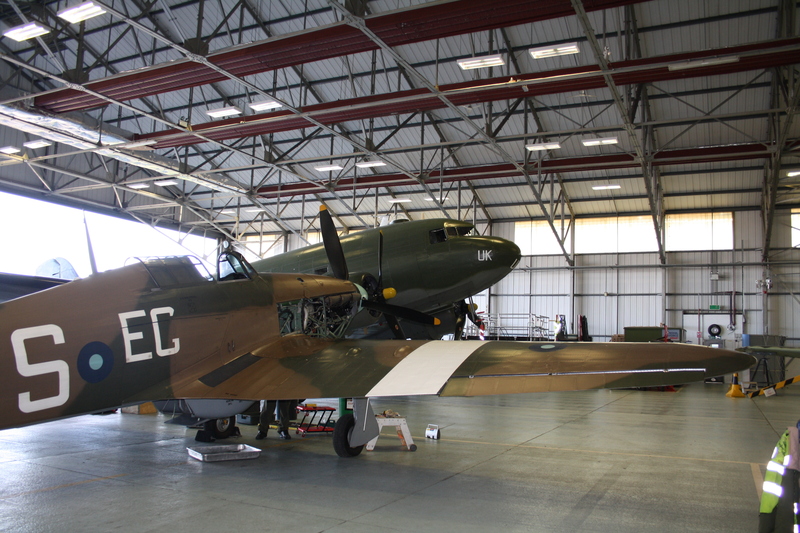 The Heritage Centre has several airframes in its keep but they are presently in a state of flux due to the refurbishment of 1 Hangar with it’s contents being transferred into the Centre’s 2 Hangar. It is hoped that this is only a temporary move but as yet the situation has not been clarified. Our thanks to the heritage centre staff for a very informative tour and in particular our guide Tom Evans. The centre has a small café and rest room with hot drinks on sale in lieu of a donation plus various fundraising items for sale and toilet facilities. Admission to the Heritage Centre is free but any donations made go to the Guide Dogs for the Blind and the upkeep of the Heritage Centre. *1 The Red Arrows carried out one further full practice flying display after we had left. *2 The Hunter took off later in the afternoon and was noted carrying out two overshoots at Coningsby. A flight of four Typhoons also returned around this time but no serials were noted as they taxied to the HAS areas after landing . Our thanks to member David Thompson for compiling this report and Colin Fawcett of CAS for organising the visit. Some FLAG members joined with colleagues from the Cleveland Aviation Society on their arranged visit to RAF Linton on Ouse. We were welcomed to Linton on a clear but very cold day. Visits were made to hangars during the morning where we had the opportunity to see Tucanos close up. 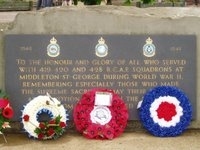 Our host was a student pilot on 72(R) Sqn. 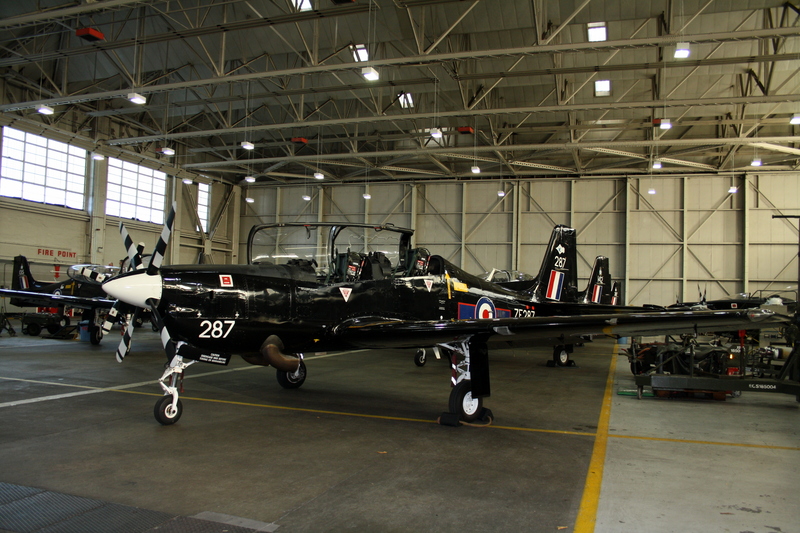 who gave us an excellent brief followed by the opportunity to be 'hands on' with the Tucano. This was followed by a visit to the Linton Memorial Room in the Halifax Block where the curator, Wg Cdr (Rtd) Alan Mawby, briefed us on the room's contents and the history of RAF Linton on Ouse. After a cold morning, a good lunch in the Officers Mess was welcome, which set us up nicely for the afternoon session. 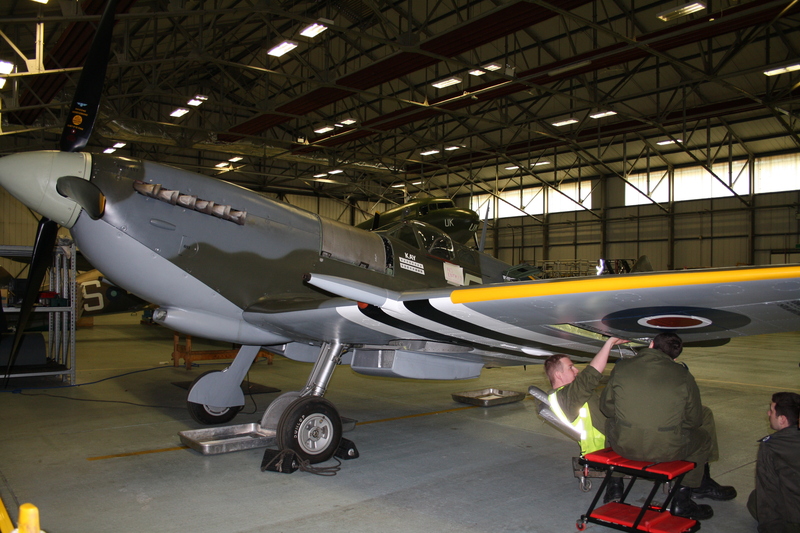 This included visiting the Tucano engineering hangar where aircraft in various states of assembly were being serviced and undergoing modifications. All this work was undertaken by Babcock as part of the present arrangements at Linton to deliver aircraft to the flightline. 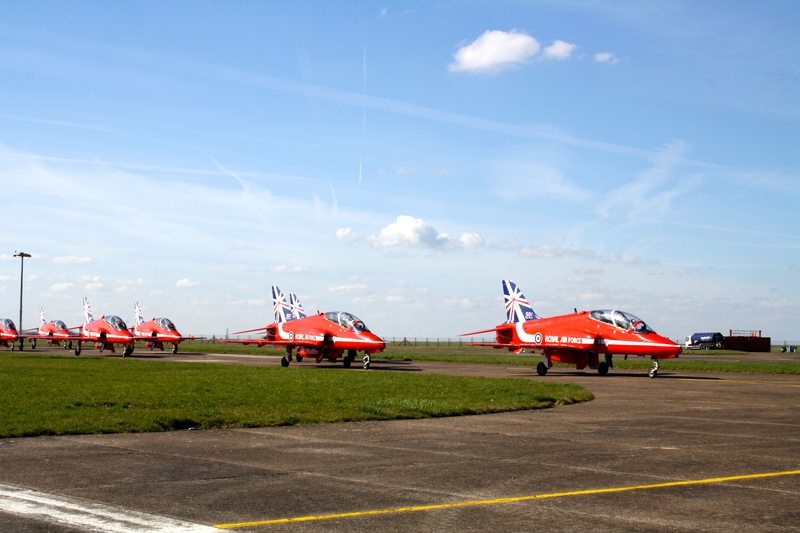 A visit to the old tower then followed enabling us to watch the flightline and circuit flying. Apart from the usual Tucanos there were overshoots by Typhoon and Tornado as well as a visiting Chinook. The final destination took us across the active runway to the new tower complex where we were briefed on ATC operations, both in the visual circuit and beyond. Of particular interest in the radar room was watching the controller use the PAR to talk down a student pilot onto the runway. 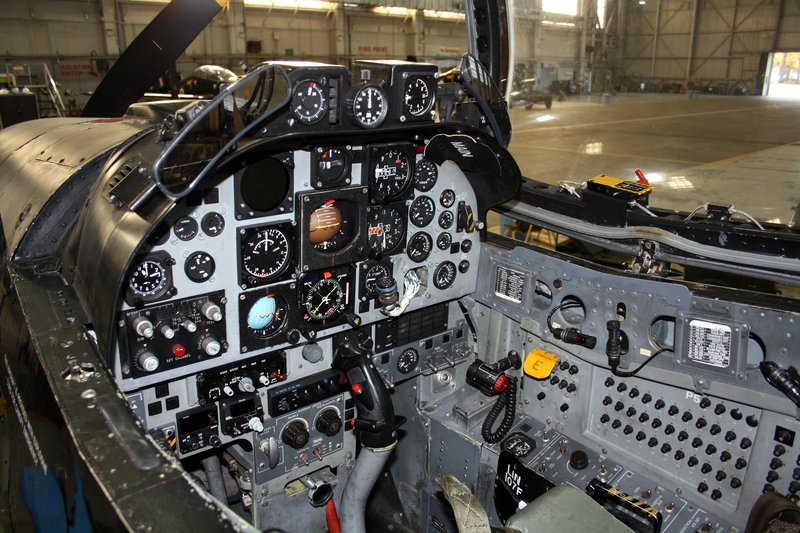 Details of Aircraft observed during the visit can be found in the Resources Zone. 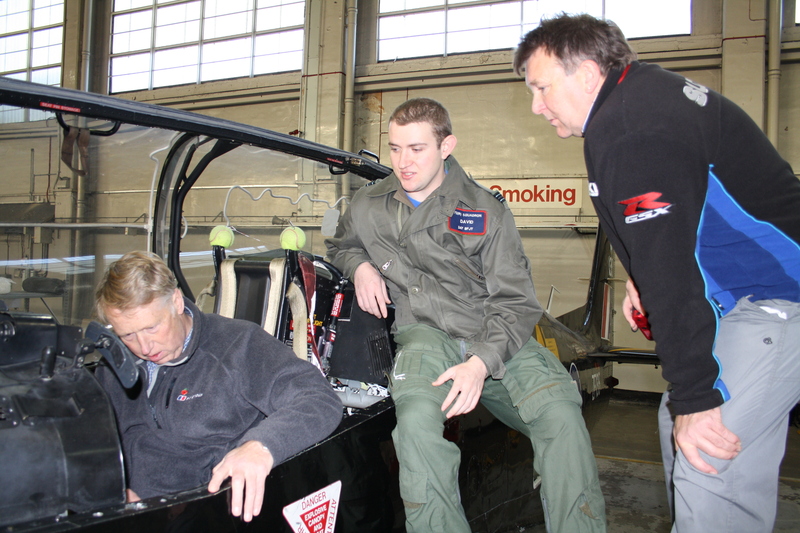 CAS members David Thompson and Colin Fawcett are briefed on the Tucano cockpit by our host. 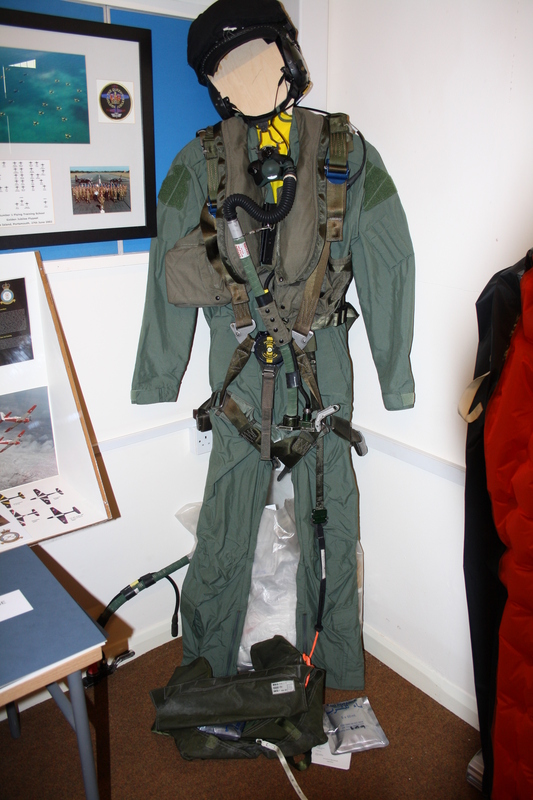 Cleveland Aviation Society is another local aviation group which currently meets every second Tuesday of the month at Middlesbrough Municipal Golf Club 8 pm. 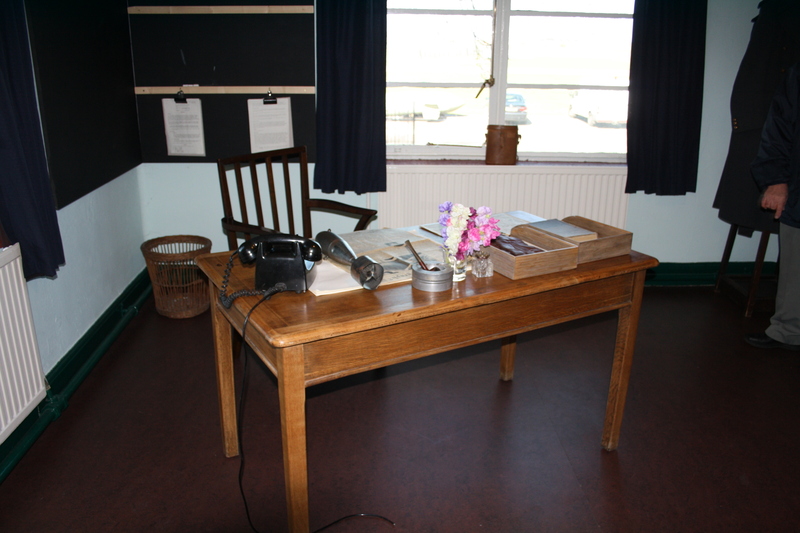 Most of the Memorial Room deals with the WWII role of Linton on Ouse. 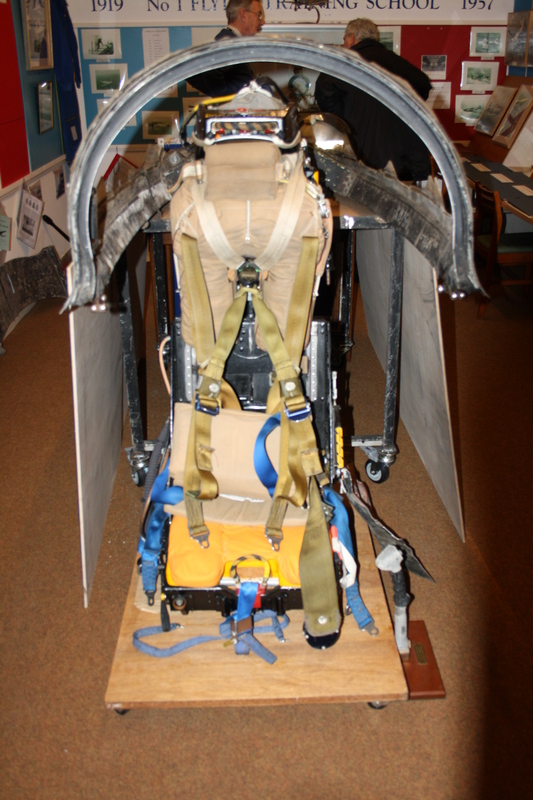 An annexe however, shows memorabilia from Linton's post war history including the flying kit and ejector seat both seen here.